What’s for Dinner Wednesday: An April Fools Day Dinner! Not for pranks, but just for fun, an April Fools Day Dinner! If you’re a fan of The Whole Bag of Chips, you know from reading over the years that I incorporate creativity into our meals whenever the opportunity exists, whether it’s green smoothies for St. Patrick’s Day or creating a special cake for a sleepover birthday party. I always try to make things fun whenever I can. But I don’t love April Fools Day and I never commemorate it in any way at home. In general I don’t love pranks, especially when they’re mean, but last year specifically, we had a terrible April Fools Day, with a funeral in the morning and a wake in the evening. It had been such a sad day all around, and yesterday I was thinking back to that day and all that took place throughout, and I was thinking of those two families one year later in their own lives, as well. As sad a day as it was last year, I decided that I’d do something fun this year. For the first time ever, I’d acknowledge April Fool’s Day with some mealtime antics. For once, we didn’t have to be anywhere before or after dinner and it was a beautiful day outside. I clicked over to Pinterest, and I searched for April Fools Day Dinners. There was certainly plenty to choose from! I quickly assessed what was offered and thought about what I wanted to do and what I didn’t want to do. I didn’t want to have candy or dessert for dinner, so that ruled out all of the neat ideas for making things that looked like dinner, using candy. As cool as that sounded, I wanted dinner to be dinner. I saw lots of ideas for using meatloaf and mashed potatoes for cupcakes and cakes, which I thought would have been perfect, had I not just made Shepherd’s Pie last week, and a whole lot of it, enough for leftovers a couple of times. We were meatloaf and mashed potato’d out, but it’s something I’d consider for another year. I finally found something I could pull off: an April Fools Cake recipe that looked like a cake but was actually similar to a pizza. 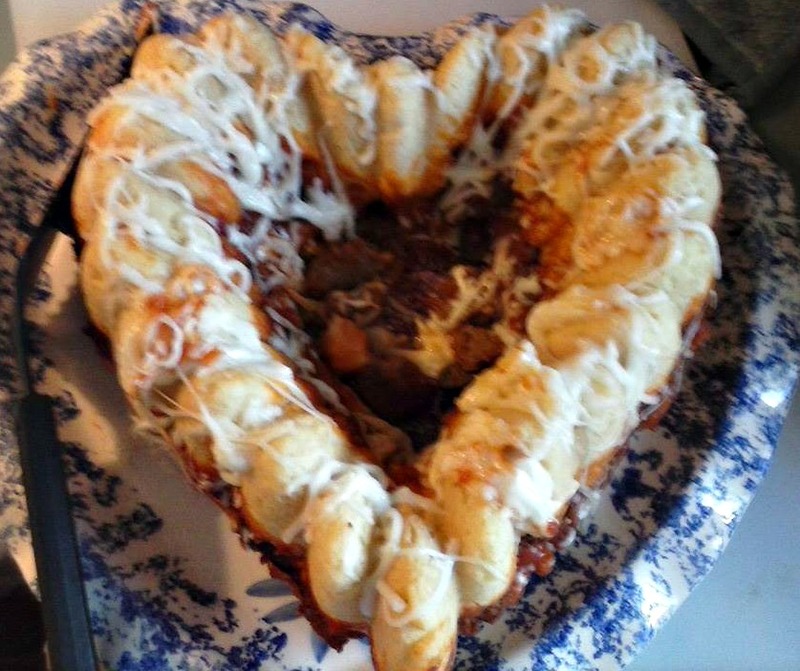 It was from Taste of Home, and it called for using a bundt pan, of which I only have a heart-shaped one, but I thought that’d add to the fun. At first I thought I’d do this to surprise the kids, but then I decided that time-wise that wouldn’t work out very well since I’d have to do it while they were all here. I opted instead, to let them in on the fun and give them all a job to do in creating our “cake” for dinner and they could in turn, surprise their dad when he got home from work. The months of March and April are pretty insane for an elementary principal, with lots of dinner-less late nights, and I thought this would brighten his day as well as give the kids something fun to do. I also decided to make “Dump Cake” for dessert so that they could then say we were having cake for dinner and cake for dessert. I had them help out with that also, but that’s a post for this week’s Fun Friday! You’ll have to check back in a few days to see that post! The recipe was an easy one and I had to modify it to use what I had at home because I didn’t want to go out to pick anything up or spend any additional money on ingredients. Their recipe called for a Bisquick type of mix, which I had here. It called for three cups, and when I measured what was left in my box it was *exactly* three cups. That was pretty great. It called for sausage and pepperoni in the “pizza” type of filling but I opted to use meatballs instead, since everyone likes them. I also threw in olives. It called for slices of mozzarella cheese for the “frosting,” which I did not have. I had shredded instead. I decided we’d be “drizzling icing” instead of frosting our cake. It worked out fine. Overall, this was a fun recipe for April Fools Day dinner. I don’t know that it’s something I’d incorporate into our regular menus throughout the year, as we regularly make some kickin’ real pizzas that I like much better. But, it was fun, and the kids liked surprising their dad, and he liked playing up the surprise as well. He enjoyed the meal. We followed dinner by a long walk outside until after dark, and came in for our Dump Cake dessert, which was really just a perfect day to replace my memories from last year. Now next year when I look back on April Fools Day, it won’t have such a dark shadow in my mind. Instead, I’ll remember this day, which was much, much better. No sadness or pranks, thankfully, but some great, great family memories. And I’ll take that ANY day of the year. Below is the Taste of Home recipe as they have it on their site, with all of my modifications in italics. Their recipe served as my inspiration, but I adapted it to suit our needs quite a bit. Next year, when April 1 rolls around you might want to give it a try too! In a bowl, combine the pizza sauce, sausage and pepperoni; set aside. batter; cover with remaining batter. cake. Return to the oven for 5 minutes or until cheese is melted. serve immediately. Yield: 8 servings. ← Visit my newest post for SheKnows and Mott’s!